For this post, I’m emphatically staying out of the classroom. I’ve recently fallen into the trap, to which we all seem to have been lured; focusing heavily on our classroom practice and not so much on our bread & butter. We shouldn’t be ashamed of the fact that we teach PE. I’m sure if we look back on our PGCE (or PE with QTS) days, we were motivated heavily by the lure of teaching out on some field with a bunch of kids, whatever the weather. We all used the same lines in our first interviews; yes we are first and foremost educators, but the practical, physical element is what pushes our buttons. Core PE for me is the most important part of the job by a million miles. You will find that some kids are absolutely buzzing about the activity. They might never have had the chance to legally smash people around in their lessons pre-secondary school and are now very happy to be doing Rugby with you. Some kids will get on with it with a hint of enthusiasm, but not necessarily love the sport. Some kids will hate the idea of having to lay hands on another human, let alone have someone do the same to them. So there you have it; we’ve got the jocks, the inbetweeners and the softies. What you’ve now got to do is make Rugby lessons enjoyable for all of them. Good luck. Timetabling is important. If you want your little Year 7’s to take away positive experiences, put Rugby as the 1st or 2nd activity on your curriculum calendar. If you start the activity after October half-term & have never done any Rugby with a group before, chances are the weather will kill you. In the Northeast, once you get to that 1st half term, it’s time to put the shorts away & stop pretending to be hard as nails. It’s Baltic. Imagine how an 11 year old is going to cope with contact skills for the 1st time when his hands simply won’t work in the cold. Leave the character-building & “hairs on the chest” to the private schools. At our place, year 9 and 10 boys core PE is ability grouped. The bottom sets simply don’t get timetabled on Rugby after half term 1 for the same reasons as above. This might sound ridiculous but I think it works. Contact isn’t just tackling, ruck, maul & scrummaging. You need to encourage kids to hit the deck properly, hit contact shields & become comfortable with physical contact with other pupils and objects. I like using contact shields loads in warm-ups. Get kids punching the pads like boxers to warm up shoulders & arms. Lay out as many pads as you’ve got in a grid and get kids to drop onto them “knee, hip, shoulder” as the jog past. In your warm-up, pair kids up – play “follow the leader”. When shouted, ball carrier drops onto ground/shield and pop passes from the floor (union only please!). These ridiculously simply warm up activities all help build confidence. Sounds obvious, but there are still times you’ll see a warm up at the start of the lesson with some kind of running around aimlessly, whilst the teacher sets up their cones for activity 1. I know this because I did it on Friday morning. If teaching contact skills, always try and incorporate some elements of contact in your warm up. Press-up wrestling is one of my favourites (assume press up position facing partner, attempt to get partner to put elbow, knee, torso, full body on ground). It goes without saying, your kids will almost certainly differ in height, weight & physicality. Kristian Jowett at my school was a 6ft 1inch man in year 7. Imagine being paired with him in your 1st ever lesson (Jon, Tick, you know that he was a big lass as well as I do but we’ll keep that secret). Encourage kids to work with a pal; someone of similar size, strength or ability. Give choice. You might set up a few different activities or practices with a variable amount of physical contact. Let students pick which one they’d like to attempt. Hey, if they improve, they could move on to the next stage of challenge. Oh is that you Mr Ofsted inspector? Did you see that progress there? 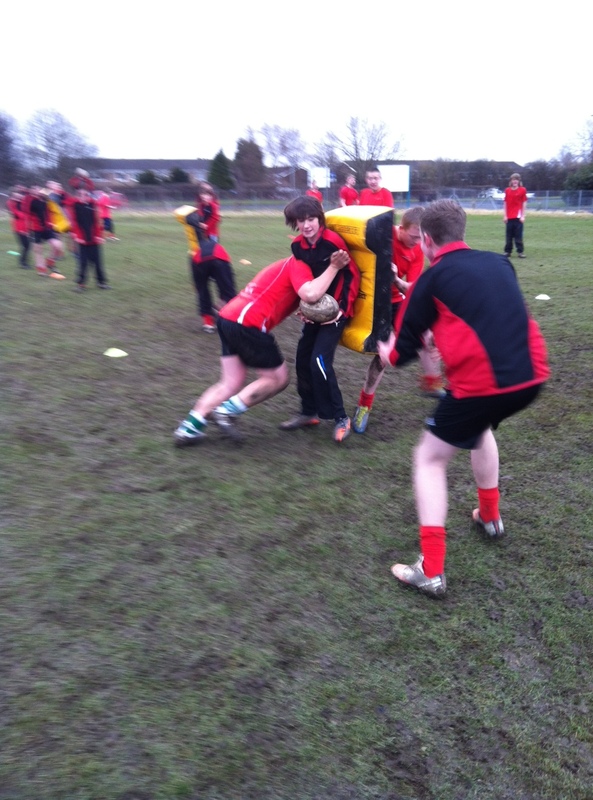 When introducing tackling, I usually start with a pad/shield-based warm-up. Getting kids adopting good body position (“Aeroplane swoop” – get them to swoop on approach, touching the grass with one hand to get low), make it competitive by putting a cone behind the pad-man – see if you can drive the pad man behind his cone. Rather than just moving straight onto tackling a partner, stick with the pads. Instead of standing holding the pad, put the pad upright on the floor with pad-man supporting it from the side. Get kids tackling the pad; using all your teaching points, body position, head, shoulders/hips, arms, drive, landing. Once kids are ready, then move onto 1-1 tackling. Again give three or four different “stages” through which kids can progress/pick a starting point. It’s a bit like if you use SOLO taxonomy in your classroom – you aren’t expecting all kids to start from pre or uni-structural stages, so do the same in your practical. Switch things up between using non-competitive/passive practices like the examples above and more challenging, competitive situations. Our lads seem to love “Kabaddi” games “Last Man Standing” and “Ball Steal” (examples of these can be seen in the old exemplar scheme linked at the end of this post). These games are great for removing the “Rugby” from the lesson, should you encounter a group of students who are switched off. Use games like Kabaddi or “Escape from…” to make contact fun. I tend to use “Escape from CLV” with yr7’s. Arrange groups of 5; 3 attackers, 2 defenders in a 20 x 10m grid. Set up 2 pairs of cones on the try line as “scoring gates”. 1st defender is a tackler (name them after one of the heads of year/deputy heads etc). This tackler can only operate in 1st 10m. If attackers pass into 2nd 10m, tackler is defunct. 2nd defender is a “blocker” who can stand in either “scoring gate” to prevent attackers from scoring a try (I always get the blocker to be the headteacher – the last line of defence you have to cross in your escape from school). This set up helps you differentiate defensive roles as well as using a game situation to deal with the inevitable “can we play a match?” questions. You can give the blocker a shield and introduce more contact should you wish. Tell the kids that they’ve found a magic egg (the ball incredibly) and they’ve got to bust out of school past the teachers. They can only use the exit doors (scoring gates). Mad, inappropriate, but fun. Use differentiated pitches & modify rules. Pitch 1 might be Twickenham (or Headingley if you teach proper Rugby) – this might be “touch” or “grip” tackling. Pitch 2 might be Murrayfield (the Jungle at a push) – there might be tackling but rucks might be uncontested. Pitch 3 – well you get the idea. You don’t have to play 15 (or 13) a-side to assess kids in game situations. Have you ever seen that on A Level moderation day? Cater for your kids. Even if your own experience is crap, don’t pass that onto the kids. Rugby has the potential to offer so much more to kids that things like football ever could. Use it & get your kids to love it.